BATON ROUGE, La. 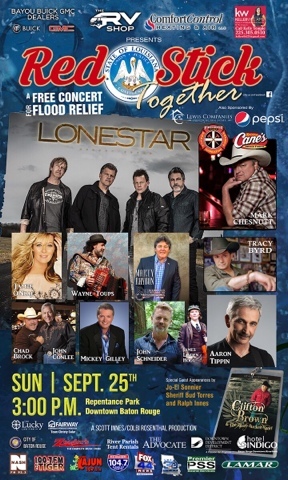 (September 22, 2016) – Grand Ole Opry country legend John Conlee and multi-platinum recording artist Mark Chesnuttcouldn’t stand by and do nothing about the devastating floods in Louisiana, so they’re joining other artists for Red Stick Together, a star-studded relief concert this Sunday, September 25 in Baton Rouge. CLICK HERE to learn more about this FREE event. “It is an honor to be a part of the Red Stick benefit for the flood victims of south Louisiana. Hope you’ll join us so we can help some folks while we have some fun,” says John Conlee. Mark Chesnutt adds, "I'm really glad to be a part of such a big show to help the people of Louisiana. They have had some hard times lately, so I hope we can bring some fun to these folks and that everyone comes out to support them." In addition to Chesnutt and Conlee, other guest artists hitting the stage includeLonestar, Jamie O’Neal, Tracy Byrd, Marty Raybon, Aaron Tippin and many more. Each artist is donating their time for the one of a kind event, which includes live music, food, drinks and relief supply donation opportunities. Repentance Park, located in downtown Baton Rouge, will serve as the location for the concert, which begins at 1:00 p.m. CT. The scenic landscape offers plenty of room for locals to gather together for the fun-filled event.